Kimberly Snyder, nutritionist to the stars who wrote The Beauty Detox Solution, now plans to launch a West Hollywood-based juice/smoothie/cleanse spot called Glow BIO (which stands for balanced inside out). Snyder says she wants to bring her detox message to the masses with organic smoothies, cold-pressed juices, and detox cleanses designed to keep patrons looking — and feeling — forever young and Hollywood glam. GLOW BIO is no ordinary smoothie/juice shop. As a nutritionist, Snyder is fully booked with clients like Drew Barrymore and Fergie and it isn’t possible for her to be a nutritionist to everyone personally. But going to GLOW BIO, is almost like having her as your own personal juice-meister. She designed and created all the products and cleanse packages in accordance with her Beauty Detox philosophy. All of their bio-nutrient ingredients are organic, live, unrefined and plant-based. All our products are completely bio-available to the highest possible degree with specific enhancing processes- namely pre-hydrated, activated/sprouted, properly combined, and with the strategic addition of probiotics. At Glow Bio they don’t use heavily refined products like agave. And some places are organic, but practice poor food combining (like mixing fresh fruit with nuts or protein powder, etc.) and don’t pre-hydrate or activate foods to specifically optimize digestion. At GLOW BIO we do all of that.This certainly isn’t a “build your own juice/smoothie/cleanse” type of shop. You don’t have to think through what’s best for your nutritional health. Snyder has already done that for you. According to Time Out New York Magazine, Three Tarts Bakery and Boutique is a “…top ten dessert destination in New York…”. Just in time for Valentine’s Day, Three Tarts announced a retail partnership with Dean & DeLuca for their Valentine’s treats. This year some of the artisanal treats for Valentine’s Day include chocolate rosewater marshmallows, custom designed petits fours – hand decorated layers of almond cake and tart apricot jam with Valentine’s Day designs, valrhona chocolate and cardamom lovelies cookies, marshmallow heart pops, and organic long stemmed chocolate covered strawberries hand dipped by dessert district neighbors Chocolate in Chelsea. 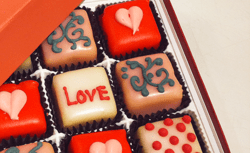 “We’re excited to be featured with Dean & DeLuca and provide our festive treats that are not just for sweethearts,” said Owner of Three Tarts Marla D’Urso. Three Tarts Valentine’s Day product is also featured on Just Desserts NYC. Beth Nicely and Amanda Larsen visited Three Tarts to kick off their 14 Days of Valentine’s tour of desserts in New York. Three Tarts Bakery & Boutique flagship store is located in the Chelsea section of New York City at 164 Ninth Avenue and can be reached at (212) 462-4392. Their second location, Three Tarts at The Plaza Food Hall, is located at New York’s The Plaza Hotel. Three Tarts is also online at http://www.facebook.com/ThreeTarts, and @ThreeTartsNYC on Twitter.